We know it can be challenging to find a family reunion location that fits everyone's budget and style. Georgia’s State Parks offer a wide variety of facilities, from small picnic shelters to large group shelters, and from rustic camp kitchens to full service catering. Everyone can stay overnight in our fully equipped cabins, hotel-style lodge rooms, modern campsites, “glamping” yurts or dorm-style facilities. Your next reunion is sure to be a big hit – complete with beautiful scenery and plenty to experience all in one location. Hiking, mini-golf, fishing, paddling, archery, championship golf or geocaching? We’ve got you covered! Children ages 6–12 will have fun learning in the outdoors as they work toward earning their own Junior Ranger badge. Our free activity book lets them experience nature first-hand, explore Georgia's fascinating history and enjoy outdoor recreational activities as they work their way through three badge levels. Many state parks and historic sites even offer Junior Ranger day camps during summer. Find a camp near you, pick up a book during your next visit or download one for free. The latest sport craze is coming soon to Gordonia-Alatamaha State Park. FootGolf is a combination of golf and soccer, where players kick a regular soccer ball into 21-inch cups. A grand opening for the new layout at Brazell’s Creek Golf Course is May 10. Anyone interested in learning about the game can play a round for free between 1 and 5:30 p.m. The rules are much like traditional golf, with players aim to kick as few times as possible across 18 holes. 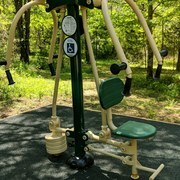 Panola Mountain in Stockbridge is the latest state park to offer outdoor fitness equipment for health-conscious visitors. Stations such as butterfly press and chest press let you work your muscles while enjoying park scenery. Many fitness stations are wheelchair accessible. Check out free fitness equipment at Gordonia-Alatamaha, Sweetwater Creek, F.D. Roosevelt, Don Carter, Skidaway Island and Fort McAllister state parks as well. Looking forward to barbecues and boating over Memorial Day? Why not extend your stay for even more fun in the sun? From Monday, May 28, through Thursday, May 31, you can save 20% to 40% on camping, cottages, yurts and lodge rooms. Check GaStateParks.org/specials for promo codes, participating state parks and details. Plus, check GaStateParks.org for ranger-led programs like guided hikes, nature crafts, boat tours, astronomy outings and more. New Hiking Trail Near Helen -- The newly opened Helen-to-Hardman Heritage Trail welcomes hikers to enjoy history in a beautiful setting. The one-mile path follows the Chattahoochee River from Harman Farm Historic Site (home of Anna Ruby of nearby Anna Ruby Falls) to the Bavarian-themed town of Helen. May is Georgia Archeology Month -- Delve into Georgia’s past with tours of ancient Indian mounds, historic farms and even colonial outposts during Georgia Archeology Month. On May 19, Fort King George welcomes Dr. Richard Jefferies to talk about the Spanish Mission period and lead a guided tour. Stay Hydrated -- A new water fountain has been installed near the bottom of Tallulah Gorge so that visitors can stay hydrated before their heart-pumping climb back to the top. Home School Wednesdays -- Roosevelt's Little White House offers great opportunities to learn about President Roosevelt, Warm Springs, The Great Depression, WWII and more during Home School Wednesdays. Many other state parks and historic sites offer home school programs as well. Find more events on our calendar and individual park web pages. Georgia Department of Natural Resources.